Established in1991, Gems & Jewelry Trade Association of China (GAC, former named as Gemological Association of China) is affiliated with the Ministry of Land and Resources of P.R. China. It is a governmental and member-based organization and headquartered in Beijing. Currently, GAC has more than 2,000 corporate members, 200 of which are oversize jewelry enterprises.There are 12 different branches and committees specialized in various areas under the supervision of GAC. The mission of GAC is to provide great services to the members and to promote the development and regulation of the Chinese Jewelry industry. It has devoted itself to establish regulations and to creat policy-friendly environment for the industry.GAC has been focusing on pushing forward the development of the Chinese jewelry brands by implementing the ‘Chinese Gems and Jewelry Industry Credit Evaluation’ system, which has become the solid foundation for the upgrading of the Chinese Jewelry brands. 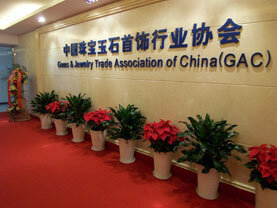 GAC also plays an important role in the international cooperation by carrying out technology and economic exchange, as well as organizing trade delegations, in order to help the Chinese jewelry enterprises to enter the international platform.Nowadays, GAC has established close relationships with embassies from more than 80 countries. It has developed collaborative relationships with over 20 countries and regions in all aspects including gems and jewelry education, training and exhibitions. As the most authoritative and governmental organization of Chinese jewelry industry, GAC popularizes the jewelry culture and serves its members by publishing the GAC Newsletter and magazines including the China Gems and BAZAAR Jewelry. It also established an official website to provide up-to-date information on Chinese and global jewelry industry. GAC annually hosts 3 international jewelry fairs in Beijing, Shanghai, and Shenzhen to provide a platform for the domestic and international jewelers to showcase their latest products and to meet potential distributors and buyers from domestic and international. 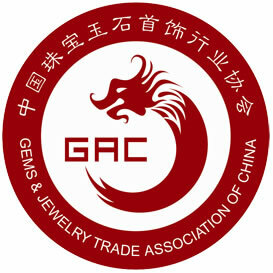 Actively promoted by GAC, 24 jewelry industry bases were built up all over China and have achieved remarkable results. These bases specialized in Pearl Culture, Jadeite processing and jewelry inlay which have brought vigor and vitality to the local economic development and prosperity to the Chinese Jewelry industry. Through efforts, GAC has achieved great improvements on foreign relationship, working efficiency and service standard. Bearing its mission in mind, GAC has become the most authoritative and influential social organization among Chinese jewelry industry.